Albrecht Dürer was born on May 21, 1471 in Nuremberg, Germany. He was the third child of between fourteen and eighteen children. His father was a goldsmith. Albrecht's godfather, Anton Koberger, became a printer and publisher in the same year that Albrecht was born. His most famous publication was the Nuremberg Chronicle, which included many woodcut illustrations. Albrecht may have learned about woodcuts and printing while working on this publication. Albrecht, at the age of 13, was the first artist to create a self-portrait. Using a mirror he worked to draw his likeness. He said, "I drew it when I was still a child." In later years he produced 3 more portraits of himself. At the age of 15 Albrecht was showing a talent for drawing. His talent was recognized, and he became an apprentice to Michael Wolgemut, an important artist in Nuremberg at the time. His workshop created a variety of art works, particularly woodcuts for books. 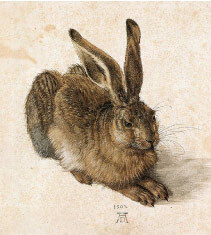 Dürer made many drawings, watercolors and oil paintings during his lifetime. Sixty of his oil paintings remain. His most celebrated works include Young Hare (1502), The Praying Hands (1508), and Rhinoceros (1515). 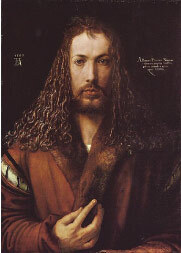 Albrecht Dürer died on April 6, 1528 in Nuremberg, Germany. He is regarded as one of the greatest artists of the Renaissance Era, and the greatest printmaker of all time. 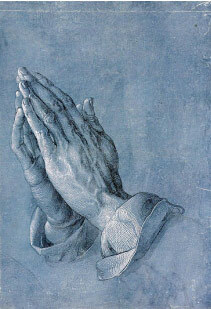 The Praying Hands is one of the many drawings Dürer made as he planned a new painting or engraving. These praying hands would later be the hands of an apostle for an altarpiece. Rhinoceros is a woodcut that Dürer made from a description and a sketch by an unknown artist. Dürer had never actually seen a rhinoceros, as it was a very rare opportunity in his time. Despite its inaccuracies, Dürer's woodcut became very popular. It has been said that "probably no animal picture has exerted such a profound influence on the arts".